Now that Sheldon Adelson's family owns the Las Vegas Review-Journal, how should the newspaper handle stories that involve Adelson? Or to ask the question another way: How can and should the paper cover itself? A meeting that was held on Monday attempted to tackle those questions, but left editors feeling frustrated. Management brought in Dave Butler, the executive editor of the Providence Journal, to "help establish some guidelines." The Review-Journal and the Providence Journal are operated by the same company but owned by separate groups. According to features editor Stephanie Grimes, who live-tweeted the meeting, Butler expressed concern about the appearance that reporters are "out to get our owner." "How often do we need to mention the owners?" he asked, before suggesting that disclosures won't be necessary down the road because readers will already know about Adelson's ownership. Grimes tweeted in response, "I don't think you'll find another soul in the room who thinks we should stop disclosing conflicts of interest at some arbitrary future point." Grimes' account of the meeting was confirmed by two other attendees who spoke on condition of anonymity. "I wouldn't say that it went well or that we are reassured," one of the staffers said. Adelson, the billionaire casino mogul who owns the Venetian resort in Las Vegas, is deeply involved in Nevada business and politics. He is also a prominent Republican Party donor. So for the Review-Journal newsroom, there's a disturbingly wide range of potential conflicts of interest. "At one point, we mentioned that we were worried about being able to cover some significant trials involving Adelson, and Butler said if we don't cover them other media outlets will, so it's OK," one of the attendees said. According to Grimes, Butler commented, "It's not like you're in a town where you have no TV stations." He also said, "You've got to ease up here just a little... so everyone doesn't blow their cork." Butler told CNNMoney in an email that he did not suggest that the Review-Journal newsroom back away from Adelson coverage. The meeting was "step one" of a process that will continue on Tuesday. It was "unfortunate that what was billed as a private meeting was widely broadcast. But so be it. We have nothing to hide," Butler said. "I told the staff I would take notes from the meeting and put together a proposal for review on some guidelines. Some folks are still nearly hysterical, as you might understand, and I did say let's just calm down a bit," he continued. He added, "The staff had a lot of pent-up venting to do and this was their chance. I was the one to get it, as I expected. Now we try to move on and figure out what to do. Stay tuned." 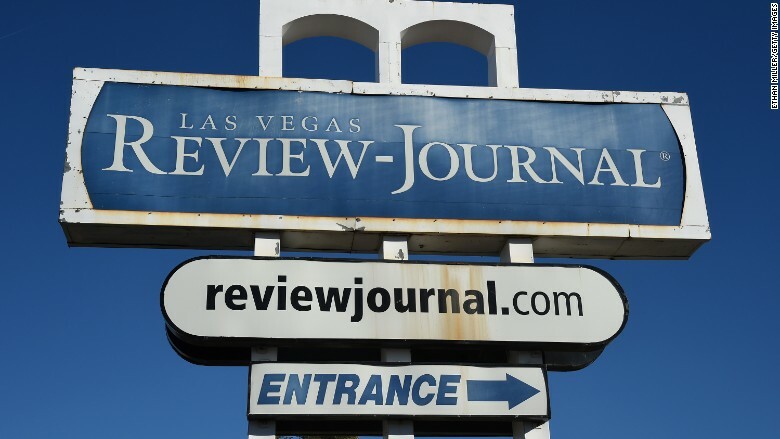 The Review-Journal's coverage of the recent ownership change has been aggressive — which is why it has received widespread support from journalists elsewhere in the country. When the paper was sold last month, the Adelson family's involvement was initially kept secret. Three Review-Journal reporters eventually revealed that Adelson's son-in-law engineered the purchase. The Adelsons subsequently said that they always intended to announce their involvement at a later date. The paper's top editor exited one week later. A search is now underway for a new editor. The Adelsons have kept the prior owner, GateHouse Media, in charge of the Review-Journal's operations. GateHouse also operates the Providence Journal, which explains Butler's visit on Monday. "Overall the feeling in the newsroom is the entire meeting was just meant to try to calm us down a bit, rather than to consult with us on coverage," one of the attendees said. "The feeling we got was that he doesn't really have much of an issue with coverage delays/cuts because other people will cover it." Reporter Henry Brean tweeted afterward, "We still largely don't know who we are working for and what they have planned." A spokesman for the paper had no immediate comment about the meeting. Grimes' tweets were widely shared in journalism circles on Monday afternoon; some observers said they were astonished. "These people don't realize that telling a reporter to lighten up on a good story is like telling a bull to avoid red capes," Jerry Ceppos, the dean of the Manship School of Mass Communication at Louisiana State University, said in an email. Sign up for the Reliable Sources newsletter — delivering the most important stories in the media world to your inbox every day.